Our SEO services stand out from the competition by providing ongoing communication and proven results. Who have we helped with our professional SEO services? SEO is a form of Inbound Marketing. Unlike traditional media that relies on outbound contact, our techniques will ensure that customer traffic comes directly to you. 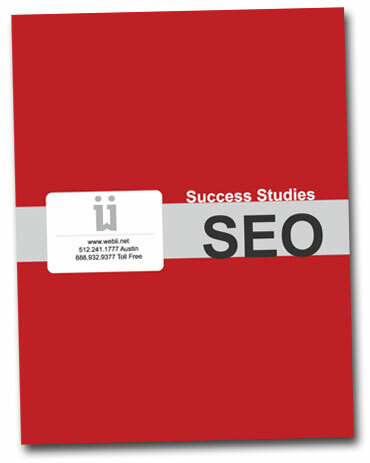 Quality Austin SEO marketing plans involve a combination of quality content, linking techniques, website code, brand, social media, usability and website efficiency. At WEBii, we employ a whole team of experts to do all of this for you. While our team works on keyword research, website repairs, blog and web page content, and other tedious tasks – you can focus on running your business and assisting customers when the leads come in. As you can see from the examples above, we have served a variety of businesses and non-profits with our SEO services. For each client, we pay careful attention to detail and customize our campaign strategy with their target market in mind. Many businesses are in competitive markets, and we can learn from their competition to improve the website and keywords. Some clients are in very niche markets, which gives us a fun challenge to come up with creative keywords that will attract the best customers. Interested in learning more about how we can help you with your SEO strategy? Contact us now.